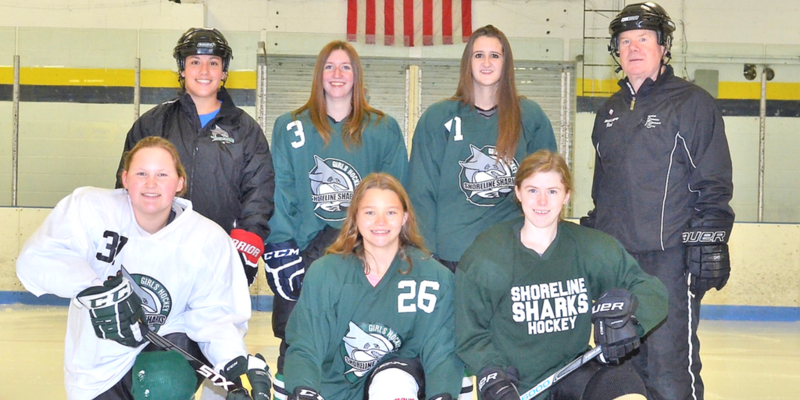 In support of our belief that you are never too old to learn how to play hockey, our Junior Shark program targets older girls (11+) new to hockey. Whether they are thinking about playing high school hockey or just want to try the sport, the clinic will prepare participants for team play. Using a mixture of drills and small area games, the girls will start with skating basics and end the session with a full ice scrimmage. In just 20 weeks, the girls will be comfortable skating, understand the basics of hockey and gain a sense of accomplishment. Participants start with skating, working on forward stride, edges, crossovers and stopping. The girls will move on to hockey skills including puck handling, passing, and shooting. Small area 3 vs 3 games are added to allow players to practice their skills in a game-like environment. The final phase puts it all together, incorporating positioning, rules and board play. The clinic ends with a full ice scrimmage with developing players from our travel teams, a very exciting finale for our Junior Sharks. For those wanting to explore travel hockey, our coaches will assess the players for readiness for team play. * Equipment packages are available at Hamden Sport Center (Hamden & Northford) and Whitie Bensen (West Haven). Check our FAQ for more details. Our Junior Sharks Clinic is led by Rick Gedney, who was introduced to hockey at a young age and has continued to play ever since. He’s coached youth hockey for over 20 years in a variety of roles, including Head Coach for the Daniel Hand High School Girls Ice Hockey program from its inception in 1998 until 2012. He joined the Shoreline Sharks as a Sand Sharks Instructor in 2013, later joining the Board of Directors, serving as Director of Coaching and leading our Junior Sharks hockey development program. Outside of the Sharks, you will find Rick on the ice in Northford playing in an adult league. Typically Rick is supported by another Shoreline Sharks adult coach. All of our adult coaches are registered with USA Hockey and certified through their Coaching Education Program. They have also passed SafeSport Training and a background check.